Are you interested in Dr Shawn Baker’s all meat diet? Did you listen to Mikhaila Petersons’ story on how much better she feels mentally & physically on a carnivore diet? 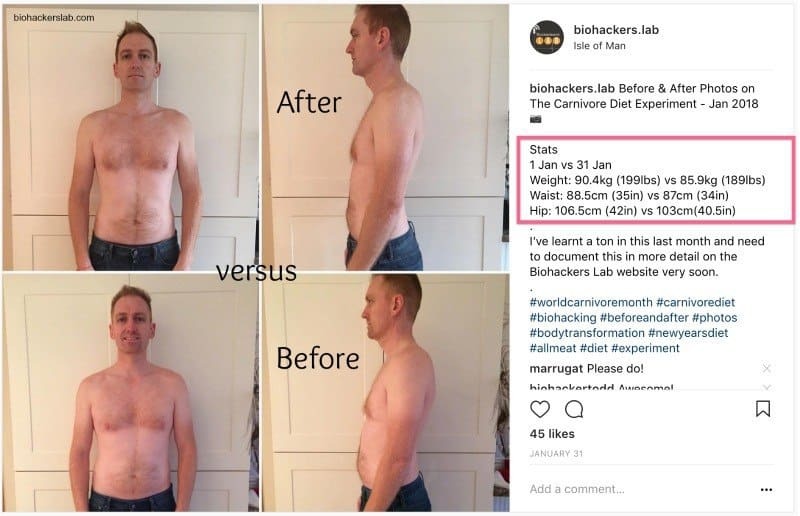 Do you want to know how the carnivore diet works, want to see some results before maybe trying it out yourself? Nothing like doing something yourself to try learn and understand what effect it will have on your body. 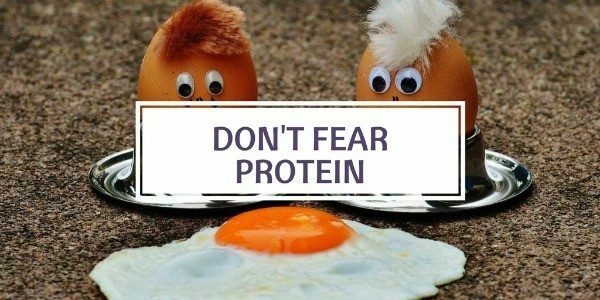 I love protein and eating meat, so to try this way of eating (WOE) was a a good dietary challenge I was willing to give a go. The summary of the pictures shows how I lost about 10 lbs (4.5kg) in weight and my hip and waist measurements came down too. My goal wasn’t to lose weight, but I did end up shedding some excess pounds. How much it costs to eat this way per day? What kind of meat do I find easy and enjoy eating regularly? What would this WOE did to my blood glucose and ketone levels? I documented my thoughts each day in my Youtube daily vlogs about the my carnivore diet experience here and shared my Keto Mojo meter device blood ketone and glucose measurements on the Biohackers Lab instagram, like this picture below. Good to know for those looking to do keto-carnivore. Should You Try the Diet? Yes, the carnivore diet is easy and simple to do for 30 days and there are lots of testimonials of how people are feeling better or seeing a positive change in their health eating this way. What you’ll read next is my resource guide with hints & tips from what I have learnt from trying the diet out, reading & listening to meat only diet advocates & experts. Hopefully this will help answers some common questions you might have before starting. The carnivore diet is a dietary plan that involves eating just animal meat for all your nutritional needs. There are no plant based foods, like fruit or vegetables, or any processed carbohydrate foods like, cereals and grains. The diet is also known as a zero carb diet, or all meat diet, and is classified as a high protein diet. A full, or strict, follower will eat just meat and only drink water. Whereas, others may include drinks like, coffee and tea, or other sources of fat like dairy products. The best way to begin is to do a 30 day challenge. 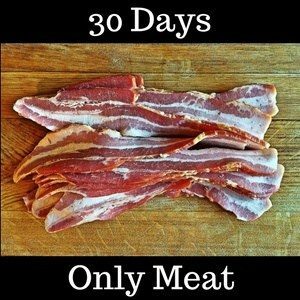 For most people who want to try start eating a meat only diet then this 1 month challenge is a good way to start. For 30 days you will follow the recommended protocols rules and tips. Use this time to see if you subjectively feel better (better energy levels, less aches and pain, better sleep , less hunger etc…), or you can see better objective health changes (weight loss, better blood results like HbA1c numbers for diabetes, thyroid levels etc…). Taking before and after pictures, keeping a health diary or tracking these lab results will then help you know if this is the diet plan for you, or not. Don’t worry, tt is very easy to get started. This way of eating is not complicated, but just needs a little preparation. I found following the following five rules below will give you a great baseline from where to begin your own dietary experiment. 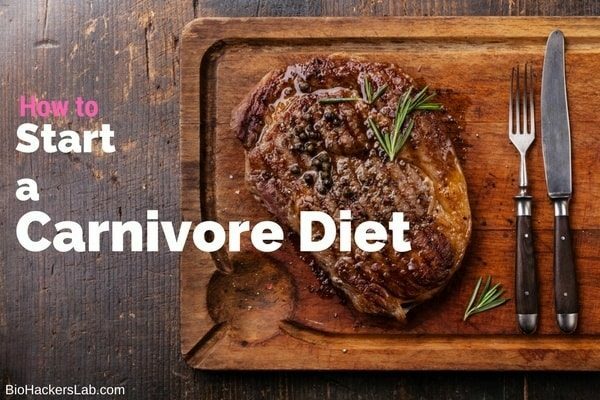 The carnivore diet, a.k.a zero carb diet, is primarily an animal meat based diet. This means you can eat 100% meat only when on the diet. You will not be eating plant based protein like, soy or pea protein. 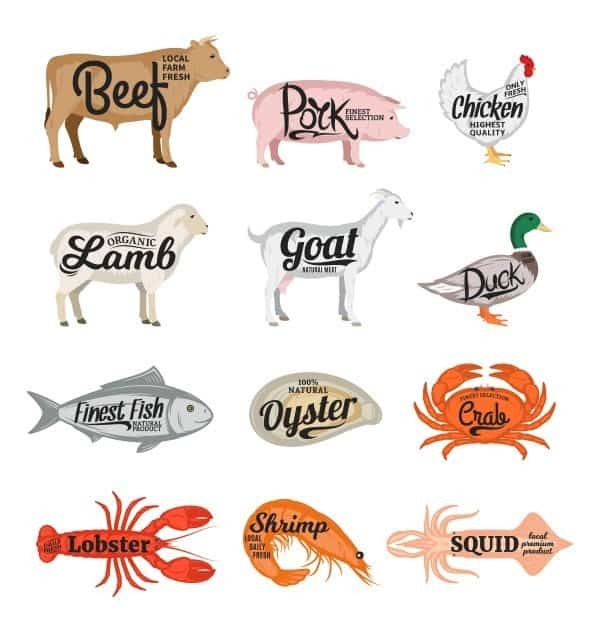 The recommended types of meat you can eat will be any type of animal based protein. Some people will add in minimal dairy fat and protein products like some cream or cheese, but some choose not to. Eat the fatty cuts of meat & not only lean cuts of meat. Natural saturated and unsaturated animal fat on the meat provides additional daily nutritional needs that your body requires to stay healthy; along with the protein, minerals, vitamins & other nutrients you get from meat. Plus, adding fat makes any food more tasty (palatable). You will want to eat till you feel full (satiated). Your appetite will change during the course of the the first month. Do not go hungry; eat to your energy needs. 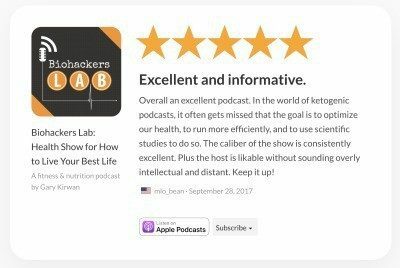 Dr Baker mentioned on the Joe Rogan #1050 episode podcast interview how he has seen many people eat on average about 2 lbs (900 grams) of meat per day. However, since he workouts out heavily, he likes to eat about 4 lbs (1.8kg) of meat per day. 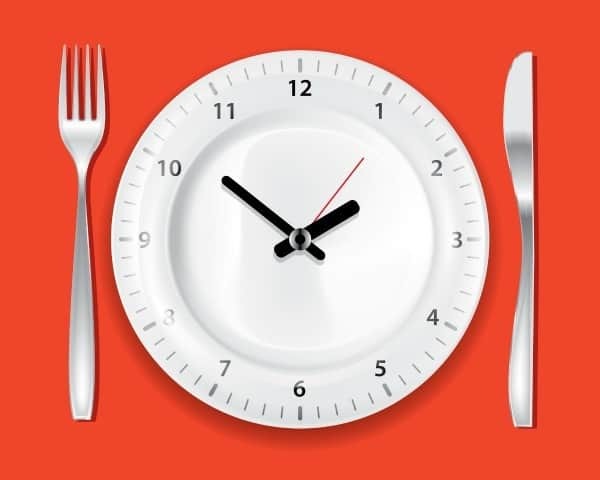 You can eat three meals a day or practice intermittent fasting (IF). This depends on your daily schedule and if you want to try add in more health benefits like practising timed fasting. If you follow circadian biology thinking then protein in the morning within the first hour of waking helps to set your body clock; so breakfast is an important meal. If you follow the advise from protein researcher Prof Stuart Phillips then eating protein throughout the day and in the evening is a good idea to help maintain lean muscle mass. This depends how strict you want to be on your carnivorous way of eating. Most people are recommended to try drink water only in the first 30 days. This can be regular tap water, mineral water, spring water or filtered water. Try add some Redmond Real salt to your water for extra electrolytes, as the salt fix book author Dr James DiNicolantonio recommends you do to avoid issues. On the zero carb diet (carnivore diet) you can cook your meat how you like it. High-end steak restaurants that value good tasting food cook red meat, like beef, to be medium rare and not well done. If you are not a fan of steak that is still pink or slightly bloody; you might find your tastes will change over time when eating meat everyday. 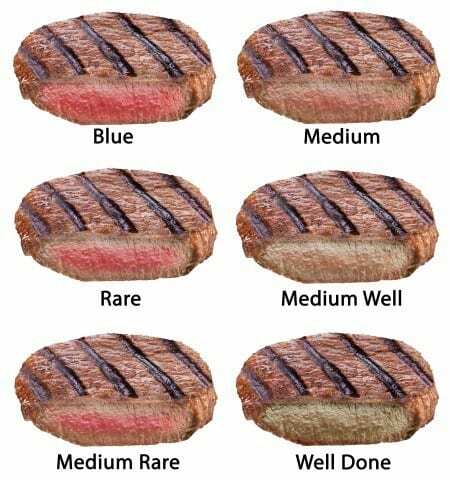 You’ll likely come to start enjoying eating medium rare steak vs well done steak. Cook other meats (chicken, bacon, fish) to make sure they are safe to eat. For example, I would not eat raw chicken or raw bacon from a food safety point of view. However, raw seafood is a must try like, sushi salmon, tuna sashimi or fresh oysters. Good cutting board for meat – Get a butchers block to cut & carve all your meat on. I like this bamboo cutting block from Amazon. Good knife for cutting any kind of meat – Get a sharp knife designed to easily cut large chunks into smaller portions for cooking. 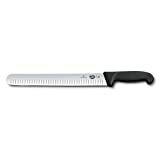 I like this Victorinox Fibrox Pro knife from Amazon. Strong steak knife set – to easily slice through your tender steak when eating. I like this kitchen knife set with storage block and knife sharpener on Amazon. Cast iron skillet or grill pan – to cook your meat on the stove top like a pro chef. I like this Le Creuset signature iron handle skillet on Amazon for cooking anything. I’ve created a list of 10 meat recipe books here that go from beginner to advanced chef mode. Here are three quick ones if you need. Michael Symon’s Carnivore: 120 Recipes for Meat Lovers – as the title of the book says loads of recipes for meat hungry carnivores. Get the book on Amazon here. Meathead: The Science of Great Barbeque and Grilling by Meathead Goldwyn– Meathead is a famous cook who will take you on a gastro science journey on how to cook the best meat. Get the book on Amazon here. Meat: Everything You Need to Know by Pat LaFrieda – this is more a textbook on just about everything most of us will need to know about types of cuts, sourcing, and cooking different meats. Get the book on Amazon here. Q: Do I Only Need to Eat Grass Fed Meat? No, grass fed meat has health and ecology benefits, but it does tend to cost more. There is no problem eating meat that doesn’t cost much and fits within your monthly budget available. Do not let choosing or trying to find only grass fed/finished meats stop you from starting. Q: Can I Eat Processed Meats? Processed cold meats like ham, salami, chorizo, & pepperoni are best avoided in the first 30 days if possible. This is because you may be ingesting extra carbohydrate fillers unknowingly with these types of deli meats. However, they are good for snacking on if hungry or travelling. Try eating one of the various Epic meat bar options, plain beef jerky or South African biltong when on the road. Q: Are Sausages & Bacon Ok to Eat? Yes and no. Bacon is great to eat how much you want. However, some sausages contain added ingredients like wheat to help fill them out. So watch out for eating only cheap hotdogs & pork sausages. Q: Is This a Long-Term or Short-Term Diet? It can be used for needed short-term health changes like weight loss or long-term general health benefits. You will find people like Kelly Hogan in the zero carb diet community forums on Facebook and Reddit who have been eating a meat only diet for several years or decades with no negative health effects reported by them. A good example of someone who has been eating an all-meat diet since 1998 is Joe Andersen and his wife. You can make only eating carnivore diet a new way of life for you if you feel & see the benefits in your body. Q: What About the Risk of Constipation? The most common question is the worry about becoming constipated. You’ll find you will likely have regular bowel movements with less stools (faeces) per day. This is said because the meat is more easily broken down and absorb in the intestines and so there is less output vs a diet high in insoluble fibre. This stool chart is a good guide about consistency, which can change depending on many factors. Q: Will Eating Too Much Meat Cause Kidney Damage? No, the there is good research that disproves eating protein about the recommended daily allowance damages kidney function. The opposite can happen and kidney function might improve by removing excess glucose from your diet and improving insulin sensitivity. Q: Do I Need To Take Supplements? Typically, no. However, some people may find a benefit from taking some electrolyte support like a magnesium or potassium supplement. A common worry is what about getting enough vitamin C? Long-term carnivore, Amber O’ Hearn, explains this is not the case and why not. Strict carnivore eaters feel if you are eating the right types of meat, and enough of them, this should provide all your required vitamin and mineral needs. 2 Should You Try the Diet? 3 What is the Carnivore Diet? 10.1 Q: Do I Only Need to Eat Grass Fed Meat? 10.2 Q: Can I Eat Processed Meats? 10.3 Q: Are Sausages & Bacon Ok to Eat? 10.4 Q: Is This a Long-Term or Short-Term Diet? 10.5 Q: What About the Risk of Constipation? 10.6 Q: Will Eating Too Much Meat Cause Kidney Damage? 10.7 Q: Do I Need To Take Supplements?